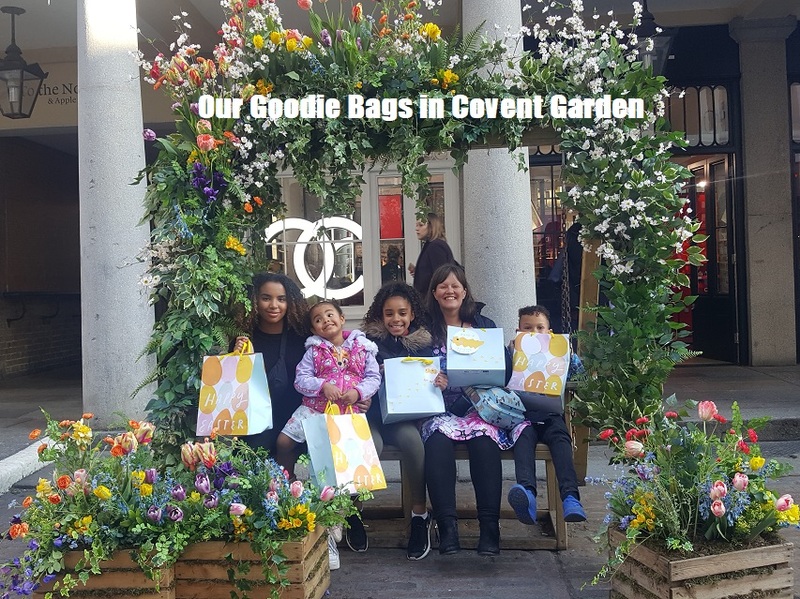 Dream come true to have access to unlimited chocolate and alcohol fizzy pop for an hour in beautiful Covent Garden :-) Lottie looked like a kid in a toy shop when upon arrival she was greeted with an Easter Egg Hunt. Warmly welcomed and issued with a basket to FILL and FILL it she did. We're still eating chocolate today 24 hours later. The older kids - my nieces and my son Aaron hung back and let Lottie dive in. Definitely she made up for their politeness. I was shouting out that at each "bush" or floral display she should leave a few for other children. 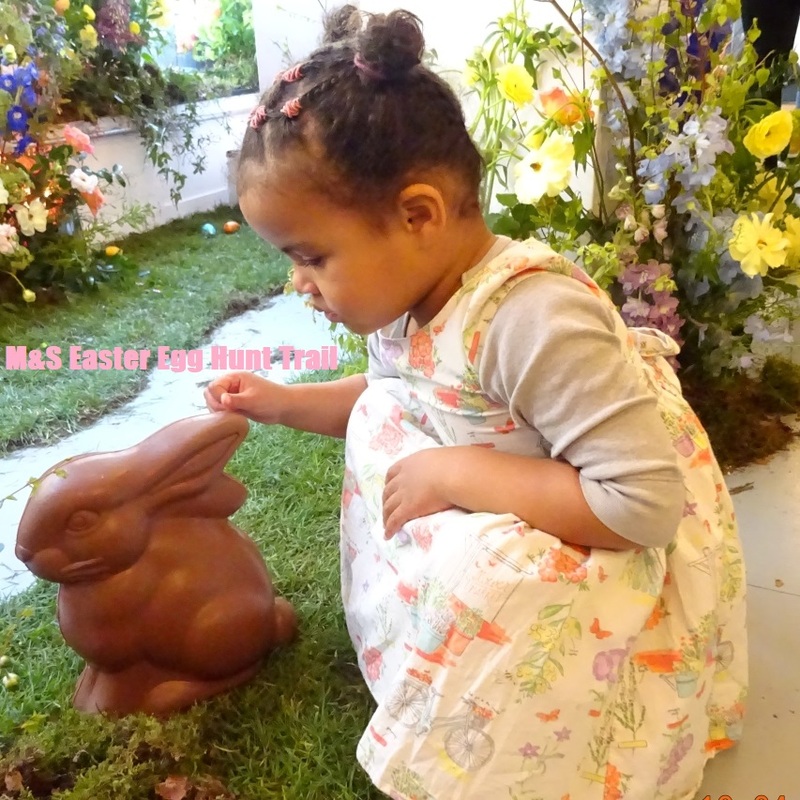 She was hopping from each chocolate location to the next in a way that would have made the Easter Bunny himself proud. Breaking news: have you heard that Marks and Spencer have revived their "This is Not Just" ad campaign? Yeah I didn't know either till I saw the hashtag being used on Instagram after this Easter Press Show we attended. Marks & Spencer has revived its much-loved This is Not Just marketing campaign after a 12-year absence, with the launch of new adverts that give the strapline a modern twist. The new campaign also comes weeks after M&S unveiled a new deal with Ocado, which will see it step into online delivery for the first time once the partnership comes into effect in late 2020. M&S’s new set of This is Not Just adverts were directed by Charlie Stebbings and Guy Manwaring, who spent four months creating them. The adverts also pay homage to the original campaign and all show various people in key moments daydreaming about items in the M&S food range. For the adults we were greeted with Gold Crème Brulee Liqueur served IN cracked Easter Eggs as below. This is not just alcohol this is Marks and Spencer's alcohol. My Prosecco was bottomless too so all was good :-) I had a laugh with them as I thought someone had just put a thumb through a whole box of chocolate eggs. It took a lot of mingling over to Lottie and back for me to realise that being that they were ON a bar they contained a drink. The hashtag at the event was #MyMarksFave and I have to say without a doubt, hands down these were MINE. 6 White Chocolate & Passionfruit Eggs - Serves 6 (Pre-order for Easter collection 18th-20th April) are £12 for six. Be quick they are currently sold out. I didn't personally taste this cake but I did fall in love with this Easter Cracked Egg Cake it and take the above photo. What I can tell you is that it retails at £15 and I think you'll agree is a show stopper for any table. Layers of sponge filled with strawberry jam and buttercream, decorated with vanilla flecked buttercream, a cracked white chocolate egg and icing. 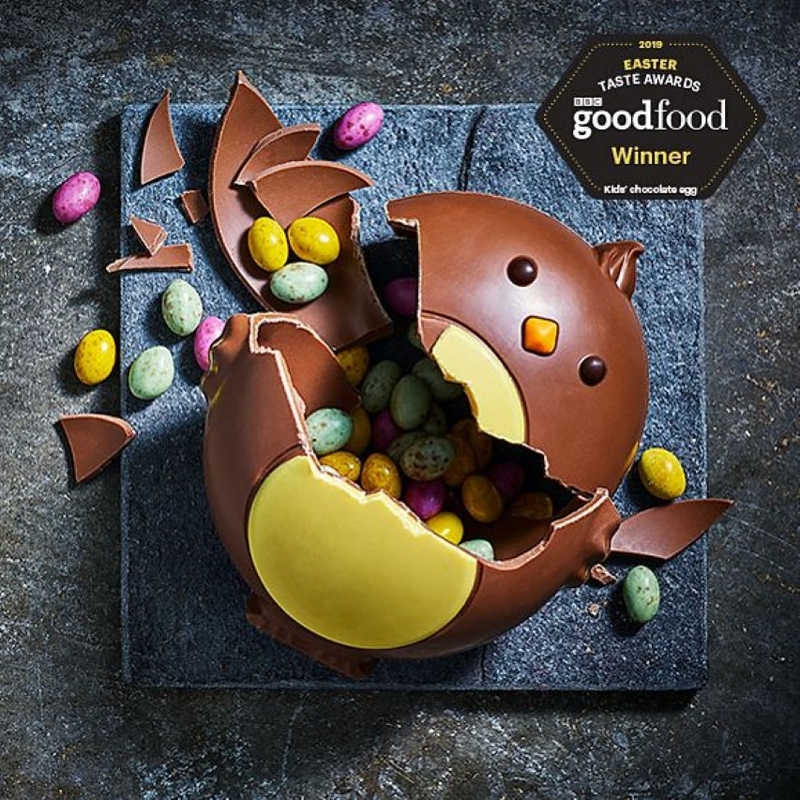 Our cute Chicky Chicky Bang Bang egg is made for sharing – smash the creamy milk chocolate exterior and let everyone tuck in to the candy-covered Mini Speckled Eggs.It even got the seal of approval from BBC Good Food, who named it the Best Kids’ Egg in this year’s Easter Taste Awards, saying it was “ideal for an Easter egg hunt”. Pick up Chicky in store now and take one home in time for your Easter celebrations. A day spent in Covent Garden called for something special. Lottie's God Mother came up with this beautiful hair design. I need to learn it myself. I'm so glad she changed from jeans to a dress as it suited the Easter Egg Hunt meadow down to a tee. We were gifted a Moonbeam the Unicorn Egg each but this is what Marks and Spencer has to say about their range of kids' eggs below. I will update this post with a pic of us and our eggs but currently I am saving them for Easter Sunday. These are not just Easter treats...Little and big kids alike will love the cast of chocolatey characters you'll find in store this Easter. Stars of the show are our new hand-decorated Angus the Bull and Moonbeam the Unicorn eggs, made with creamy milk and white chocolate. 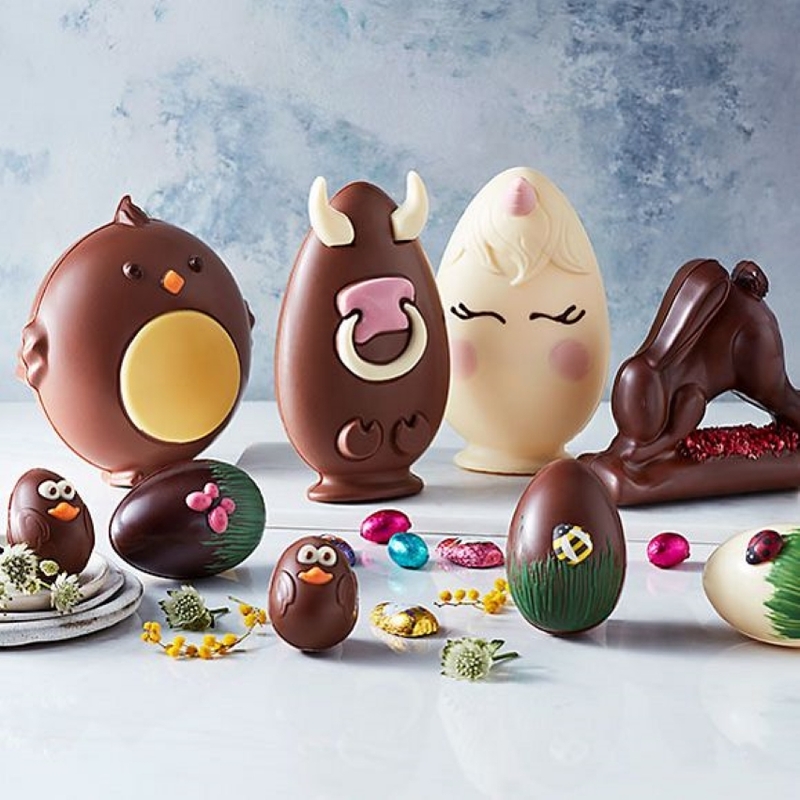 If you’re planning an egg hunt with the family, there are plenty of tempting bite-size treats to squirrel away – look out for our trio of hand-painted eggs, milk chocolate Cheeky Chicks and foil-covered Choccy Eggs. 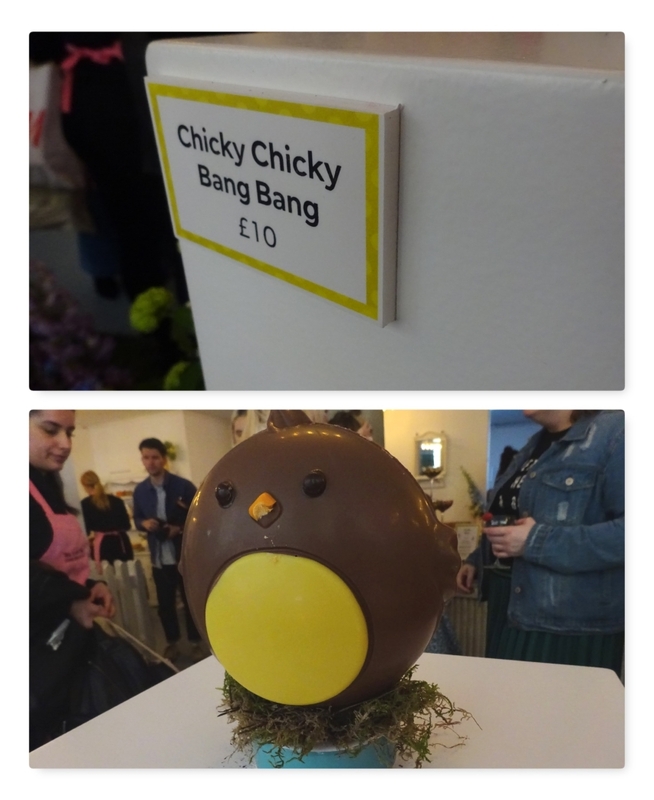 And don't forget to invite our award-winning Chicky Chicky Bang Bang egg and chilled-out Yoga Bunny egg along. 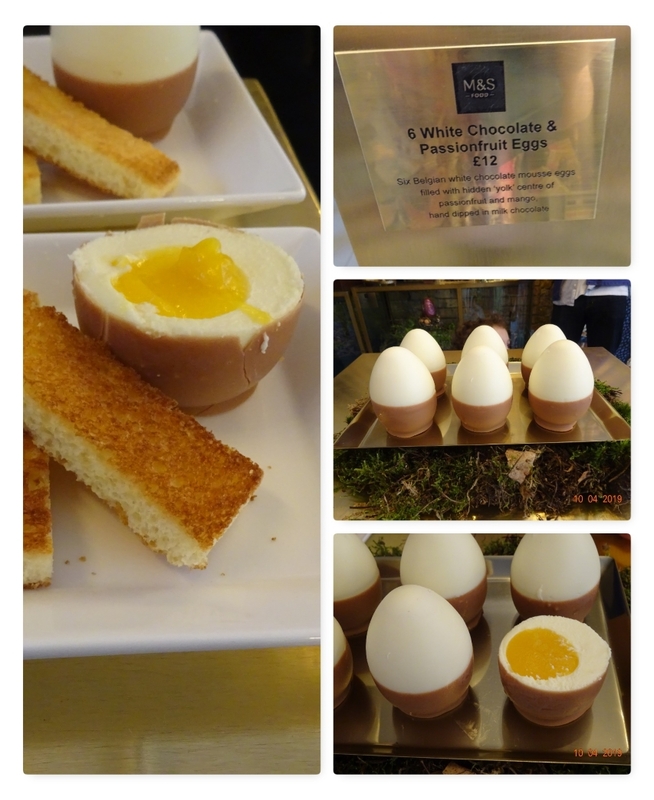 We were gifted our entrance to the Marks and Spencer Easter Press Show and given refreshments whilst there. We also received a goodie bag each as photographed, containing a packet of Hot Cross Buns each and an Easter Egg each. We are working our way through the Hot Cross Buns - there are NINE varieties including SALTED CARAMEL (I know!!!!) and there is a 10th in the form of a Hot Cross LOAF!!!!! Alas I didn't get any decent photos that I am happy with of the hot cross buns. 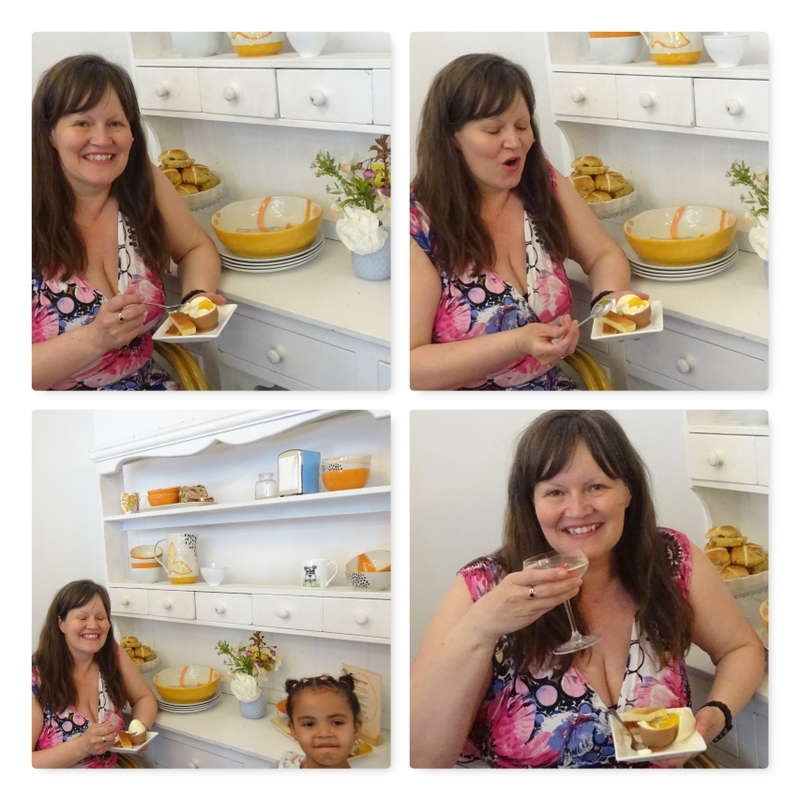 Marks and Spencer Food thanks so much for inviting us. I wasn't obliged to write this but after such a GREAT time had by all of us, I surely couldn't not. Ad: Arriving at the IMAX this morning - pic below - for Amazon Adventure 3D "a true story of scientific discovery" which was truly amazing. We are clearly not as experienced as Henry Bates (the star of the movie) at exploring, as we circled the formidable eye catching IMAX building prior to realising there were no ground level access points and we needed to find subway entrances. Hey with kids it was an "adventure" forgive the pun and Lottie was very excited with the illuminated tunnels. Besides given that I get everywhere early, even with that diversion we were still 30 minutes early, but allowed in by security yay!!! We took every opportunity we could for a photo. Once upstairs with croissants, tea, coffee and goodies bags, Serkan arrived, so 4 of the 7 cousins were together. The youngest of course has to sit on the eldest's knee........ awww! I remembered that 7th April specifically was a cast screening so I decided to explore with the objective of seeking out cast members. I wasn't disappointed to find the lovely William Postlethwaite who plays Samuel Stevens. Being that this was before the movie I was really confused when he said he wasn't in the Amazon for filming and "filmed his bits in London". I was like "with a green screen?" to be told "no". It all made sense within SECONDS of the movie starting. He may not have a tropical role but it truly was a crucial and critical one. Samuel Stevens (William Postlethwaite) was a natural history agent in London where he sold specimens of wild creatures collected from around the world. Two of his best-known clients were Henry Bates and Alfred Wallace, whom he supported on their joint expedition to the Amazon by displaying and selling their specimens. This support was crucial - it was the finances upon which the explorers relied! I'm finding myself reluctant to tell you anything about the film as I can't recommend it enough and would prefer not to accidentally give you any spoilers. Don't look at the youtube trailers as they don't in any way do it justice. The cinematography lends itself to 3d and the large immersive IMAX screen. You literally feel as if you are IN the rain forest and youtube just doesn't offer that. My kids really trust me as they came today, and woke REALLY early on the strength of the youtube videos but like me they were truly blown away. I truly don't know how those two driven explorers withstood the elements. How inspiring their journey was. Truly humbling! I'm not at all surprised the writer admitted to having a crush on Bates and feeling his was a story that must be told. After the movie I stepped away from the kids for a minute, leaving them with their older cousin, so that I could approach Director Mike Slee above. He'd spoken at length to our whole audience at the beginning of our special 7th April screening and I was fascinated by everything he'd said, sharing it in my Instagram stories. I was delighted he allowed us to have a photo taken with him. I had to split up a sibling disagreement to recruit Aaron for the photo - I don't know you can't take your eyes off them even for a moment. I was glad Aaron found his smile once again as he truly LOVED the film - captivated and mesmerized throughout. He turned to me as the credits rolled and quietly said in awe "Mum that was AMAZING!!!" Mike Slee asked Aaron what his favourite bit of the movie was and he said the camouflaging. 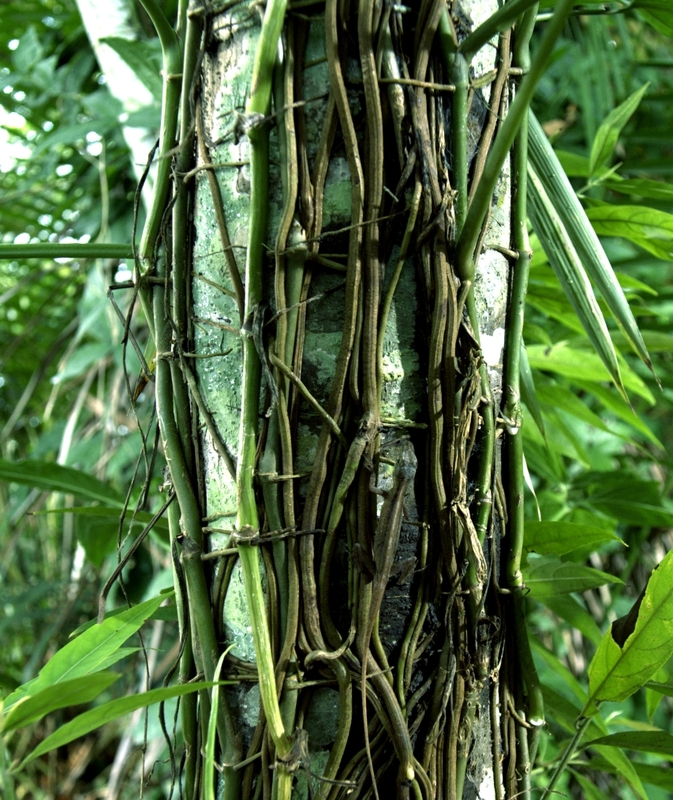 So below I give you the Vine Lizard. We had a chat about his aims one of which was that every child should watch the film. The movie is 100% a must watch in terms of education if you want to know more about evolution and our planet. The script is written (beautifully by Wendy MacKeigan) in such a way that it is digestable for kids whilst also being academically stimulating for adults. Each sentence was punchy and the pace of the story worked in beautiful harmony with the cinematography. Totally gripping, romantic and nostalgic. The story was as immersive as the huge IMAX screen itself. As for the 3d it's the best I've ever seen. Lottie was literally reaching out to try and catch butterflies as it felt like they were THAT close to us and that's even though we were up in the stars practically in the back row. Alfred Russell Wallace (Ed Birch) was in the Amazon for four years, the first of which he spent working with Bates, before there was a death in his family. He was beset by illness and forced to return to England, tragically losing his collection of specimens in a shipwreck on the journey home. He was rescued and unrelenting, he pushed on to the Malay Archipelago where he continued to study and collect wildlife and independently conceived the theory of evolution by natural selection. Henry Bates (Calum Finlay) is one of the unsung heroes of evolutionary biology. His insatiable curiosity and 11 year journey in the Amazon river basin led him to discover 8,000 species new to science and develop his groundbreaking theory of mimicry. Being that he's the star of the movie click: about Bates. I have not been told what to say and all opinions are our own. I could have sat there for a further hour truth be told. AMAZON ADVENTURE, a spectacular IMAX®/Giant Screen film from award-winning SK Films brings audiences on a visually stunning odyssey through the wilds of the Amazon rainforest in an incredible story of scientific discovery. The film traces the extraordinary journey of naturalist and explorer Henry Walter Bates - the most influential British scientist you’ve probably never heard of – who provided “the beautiful proof” to Charles Darwin for his then controversial theory of natural selection, the greatest scientific explanation for the development of life on Earth. 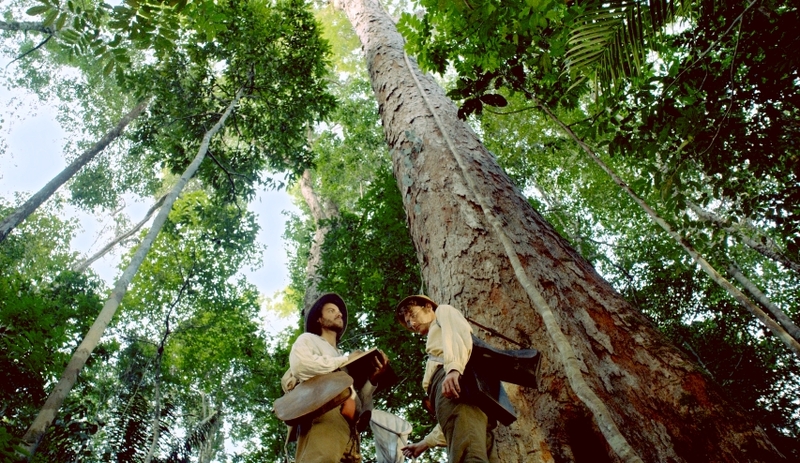 As a young man, Bates risked his life for science during his 11-year expedition into the Amazon rainforest, accompanied for the first few years by his friend Alfred Wallace. AMAZON ADVENTURE is a compelling detective story of peril, perseverance and, ultimately, success, drawing audiences into the fascinating world of animal mimicry, the astonishing phenomenon where one animal adopts the look of another, gaining an advantage to survive. Filmed on location in London, Manchester, Charles Darwin’s Down House and the remote Brazilian rainforest, AMAZON ADVENTURE uses the IMAX format to immerse viewers into a wild world of breath-taking beauty and captivating animal behavior. Things are not always as they seem in the jungle and audiences will be mesmerized by an array of nature’s masters of mimicry. From the makers of the immensely popular and multiple award-winning film Flight of the Butterflies 3D, the film is directed by Britain’s own Mike Slee and executive produced by Jonathan Barker and Sean B. Carroll, starring Calum Finlay as Henry Bates, written by Wendy MacKeigan and Carl Knutson and shot by UK cinematographers Gerry Vasbenter and Richard Kirby, with an original score by Brazilian composer Antonio Pinto. Although filming in the Amazon was very challenging, the team constantly reminded themselves of what it must have been like for Bates, without any of the transportation and communication technologies available today. The team’s commitment to authenticity not only resulted in this rigorous re-creation, even using actual instruments and tools from the 1850s, but the writing team also incorporated many of Bates’ own words, as he was a gifted storyteller. The film, a co-production between Canada, the UK and Brazil, was granted unprecedented access by the Natural History Museum of London to film Bates’ own scientific field notebooks and botanical drawings, and to film the butterflies he personally collected over 160 years ago – butterflies that had never left the museum and had to go into quarantine for two weeks after filming. Developed and produced in close collaboration with HHMI Tangled Bank Studios, the film also received major funding from the National Science Foundation. Other key partners include the Gordon and Betty Moore Foundation, the Simons Foundation and Foxconn Brazil. HHMI Tangled Bank Studios is a production company established and funded by the Howard Hughes Medical Institute as an extension of its longstanding science education mission. Dedicated to the creation of original science documentaries for broadcast, theatrical and digital distribution, the company’s award-winning programs address important contemporary issues and capture compelling stories of discovery across all branches of scientific inquiry. For more information, please visit www.tangledbankstudios.org. In a few days Aaron will have had his Treads lace up boys' school shoes a full 12 months. We haven't had to call on the 12 months guarantee once - we've just watched them last a full calendar year. Aaron is in Year 4 and we've never previously known school shoes like them! As per the tag on the pic below ours arrived on 19th March 2018. 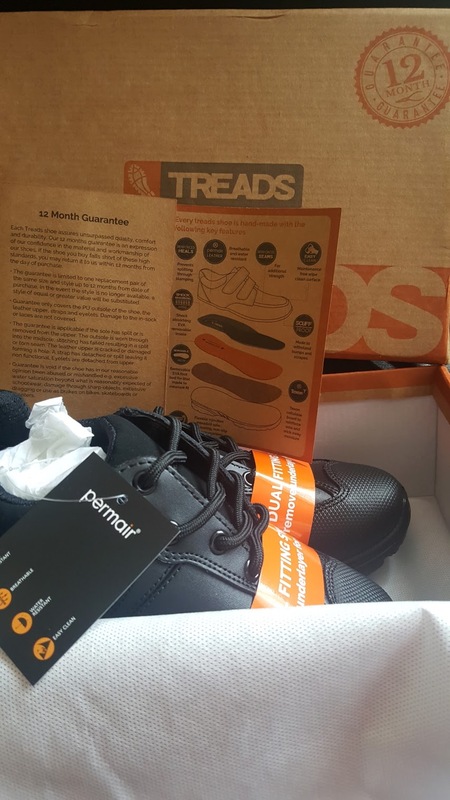 Yes it meant that September 2018, the start of the academic year, he didn't have brand new school shoes - which felt odd - but it was a relief to have 1 less expense to worry about when he needed other things. Like ALL the trousers for his rapidly growing long legs. Let's start by saying I purchased the Tokyo Treads they are/were £45 and that includes free delivery. Tokyo Boys Black Leather Lace Up School Shoe. right up to the current day. I used to be a Senior Manager in footwear and we were designers, manufacturers, importers, distributors, wholesalers and eventually also retailers, so I have seen the whole life cycle of a "shoe" - actually given that I managed the Customer Services Team I have also seen the returns/warranty/guarantee/recall side too. Despite my extensive experience I was not disappointed when our shoes arrived. I liked the packaging, the literature and the quality/design of the shoe itself. Nothing had been left to chance despite this being a new business. My first impression of the leather was that it was very like a safety shoe - something we also sold. This immediately gave me faith in their claims of being "indestructible". With the experience of the box opening being such a success as pictured below, I had that feeling one gets when opening an Apple product for the 1st time, a feeling of faith that this is a brand that knows its eggs - the touch and feel of product and packaging is superior and you breathe a sigh of relief that you're onto a good thing! If you've ever experienced perishable school shoes you'll know what a FIND this is!!! Seeing the sole broken down in the illustration below made me smile with nostalgia as before my previous employer I hadn't seen a brand do that, but then again before that job I'd never worked in footwear before so what do I know LOL. The thing I was instantly impressed with after the unboxing was that Aaron did not need to wear them in. No rubbing. No blisters. Simply comfortable immediately. I didn't think this would translate to activities but in the video above you can see how busy he got immediately, which actually brings me onto another point. Whenever there's good weather we're in the park everyday after school and not for short spells either - we're often known to be there 3 hours and Aaron does not change into trainers. Add to this we walk to and from school and the shoes have certainly been thoroughly put through their paces forgive the pun LOL! Literally the only quality concern I have is regarding the laces, so not actually the shoes themselves. They perished as pictured within a matter of weeks. I put this down to teething problems what with the product/brand being new. What actually happened was the thickness and sheeny texture of them prevents them being tied really tight which meant that not only did they come undone, but then when Aaron then tripped on them the bottom snapped off and it looked rather unsightly for new shoes as photographed. 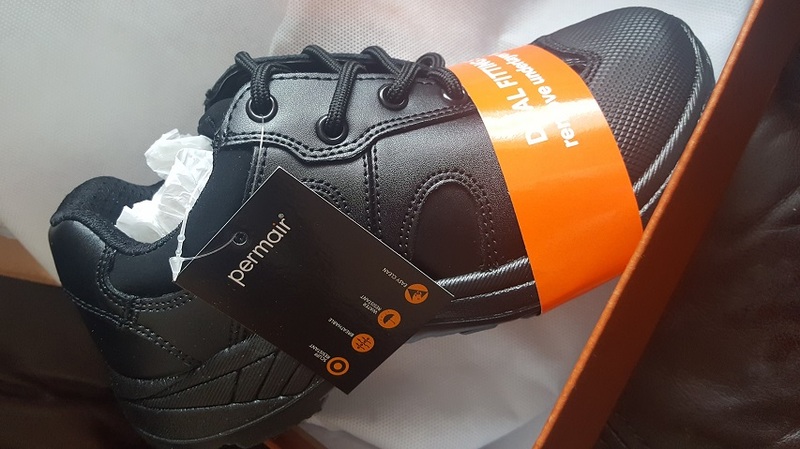 Now I can't compare this to his previous 6 pairs of Next school shoes (yep reception, year 1 and year 2 we had to get 2 pairs of school shoes per school year September and January each year) and 1 pair of Clarks' school shoes in September of year 3 before we discovered Treads in the March of 2018 as all of those were velcro fastening. It really is true what they say though about buy cheap buy twice and his Next shoe shoes were considerably cheaper than Clarks. I think Treads are unquestionably affordable for what you get in return. What I do know is that Treads did send me out new laces in the post, in fact I got a pair via Royal Mail and a pair via courier as 2 staff members acted upon my request, which was lucky as we did by the time the year was up get to the 3rd pair. Now interestingly enough, if you read the guarantee above, you'll see laces are not covered so it was a gesture of goodwill that they sent them on to me and didn't ask me to cover postage which now I see it's not covered I am grateful for. It's these little touches that foster brand loyalty and encourages me to write this review without question. 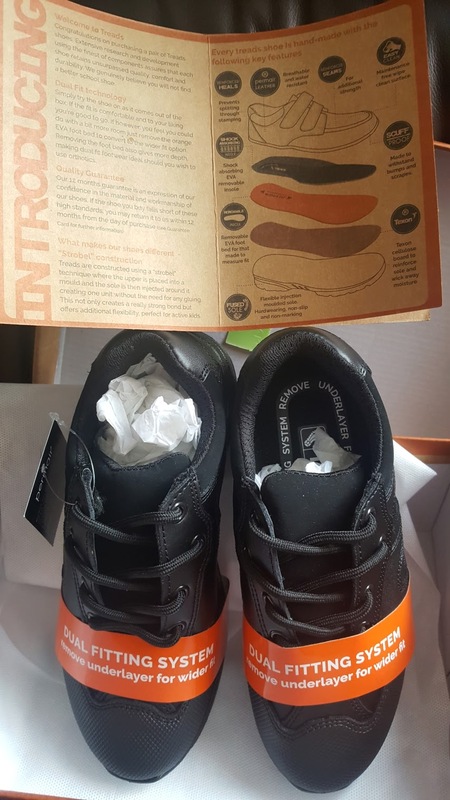 The only other concern is the orange removable insole once the shoes are a few months old keeps moving to the point where when we'd collect Aaron it would be protruding outside his shoe and have to be re-positioned every morning. It's only now as I type this and see the literature once again that I realise what with it being a removable insole we could just you know..... remove it LOL. I guess as parents we liked him having that extra layer of comfort underfoot. Overall it's a big thumbs up from us as there's nothing Aaron can't do in these shoes. What Do They Look Like a Year On? I know the majority of the reviews online are unboxing style reviews from bloggers who've not long had the Treads, so I know that means you'll be wanting to know what ours look like a year on. Now bearing in mind, I don't have a little Johnny who hops into a car on the drive every morning. Aaron mostly (apart from the rare days Daddy's rota allows) walks to and from school often walking upwards of 10 miles a week. He is also heavy on shoes in the sense that he is an extremely active boy who is never still and as I've said above wears them in the park after school. I think the shoes look great all things considered and you have to also consider they've survived a year March 2018 to March 2019 I am not talking about an academic year here September to July. 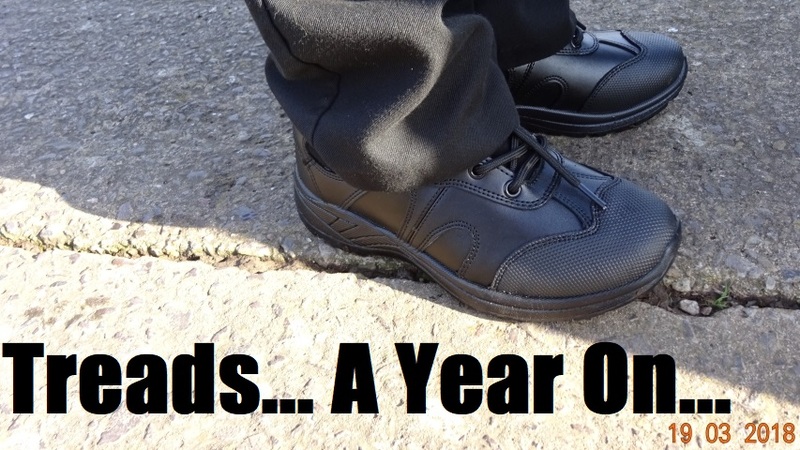 For 3 years our Next school shoes would last September to January and then January to July. It was only in year 3 when we got Clarks did they last till March but we paid extra for that fact and they didn't look as good after 6.5 months as these treads do after 12 months. I'd say the scuffing and cracking of the toe area below says more about Aaron climbing up walls than it does about the Treads shoes themselves. The protective coating on the toe area does withstand a LOT of wear and tear - I think it just met its match in Aaron. But like I say below they've only VERY recently got in THIS state. Read more about the Treads returns policy here. So this is the Treads front on so that you can see that the protective covering started to crack on the front - I must stress this has only happened very recently. This is the rear of the Treads to show how very little the heel area has worn down a testimony to the robustness of the materials used in the makeup of the sole. This is all to do with the quality of the rubber and how it withstands abrasion. This is the Treads side on so that you can see the laces really are the weakest link with this otherwise superior product. The soles of the Treads. 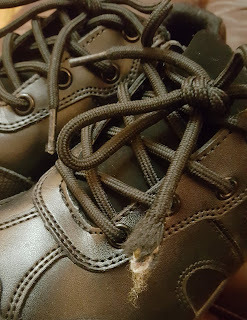 Yes there are some bald patches but they've walked hundreds of miles and there are no holes which we've often had in school shoes before discovering Treads. What is also amazing... the inner heel fabric lining that surrounds your Achilles heel below your ankle is intact and you'll know as parents how quick this often is to wear through. No.... it is still intact after what is days away from 12 months. 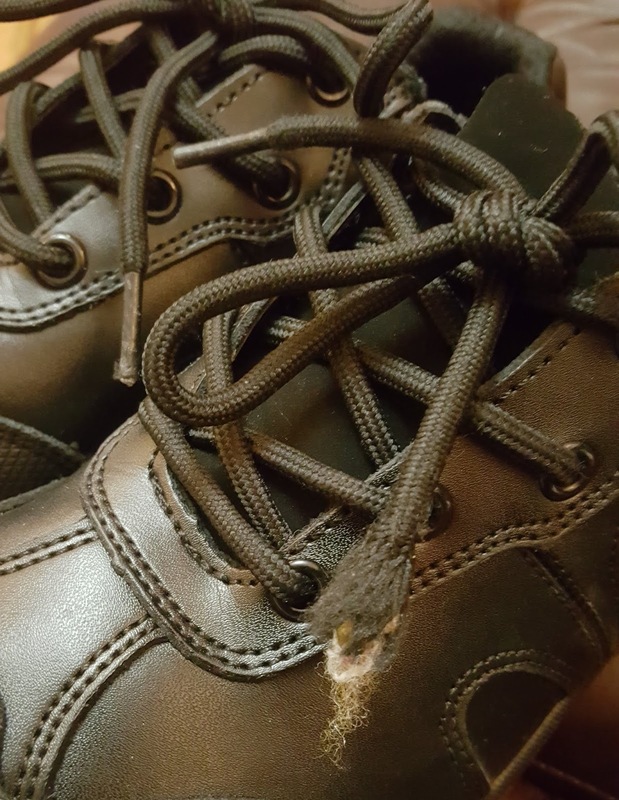 Yes he didn't wear them for the 6 weeks' school Summer holidays but other than that and regular school holidays it's 12 months wear and tear. Designed and built for active boys. Hand crafted using the finest of components; an additional protection on the toe offers additional durability, and the soft padded ankle gives all day comfort support. Made with Permair leather that is soft enough to allow easy flexible movement, offering unrivalled comfort and engineered to cope with the rigours of the school yard. The sole is tough and strong but also flexible and lightweight. Teamed with durable ‘dual fit’ technology and subtle stitching finishes off the look. Treads are constructed using a “strobel” technique where the upper is placed into a mould and the sole is then injected around it creating one unit without the need for any gluing. This not only creates a really strong bond but offers additional flexibility, perfect for active kids. Our 12 month indestructible guarantee is an expression of our confidence in the material and workmanship of our shoes. If the shoe you buy falls short of these high standards, you may return it to us within 12 months from the day of purchase. (see returns & exchanges for further information). Don't forget Treads now make school shoes for girls too. This corporate video will explain a lot of the features and benefits.